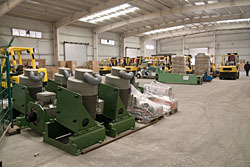 The principal activities of China Infrastructure & Logistics Group Ltd. (the “Company”) and its subsidiaries (collectively, the “Group”) are investment in and the development, operation and management of container and other ports and the provision of port related, logistics and other services including integrated logistics, port and warehouse leasing and the supply chain management and trading services, mainly conducted through its various ports, comprising the WIT Port（武漢陽邏港）, the Multi-Purpose Port（通用港口）, the Hannan Port（漢南港）, the Shayang Port（沙洋港）and the Shipai Port（石牌港）, all located in the Yangtze River Basin in Hubei Province, the PRC. The WIT Port is located along the Yangtze River in the Yangluo Economic Development Zone, Wuhan, Hubei, the PRC. 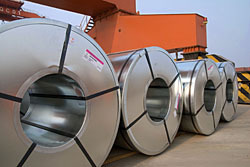 The strong and well established industrial base of Wuhan featuring operators in major industries, including automobile and its components, chemical, steel, textile, machinery and equipment as well as those in the construction materials businesses have been and will continue to be the principal providers of gateway cargoes to the WIT Port. Due to the inherent water-depth limitations along the upstream regions of the Yangtze River, large ships are precluded from navigating directly between those areas and Shanghai. The trans-shipment service provided by the WIT Port offers a more economical alternative to ship container cargoes using large ships carrying more containers to and from Shanghai and overseas. Surrounding areas which are serviced by the WIT Port include Hunan, Guizhou, Chongqing, Sichuan, Shanxi, Henan, Hubei and Shaanxi Provinces. Strategic initiatives by the government for shipping companies and the WIT Port promotes direct shipment to the Yangshan Port in Shanghai （江海直達） have further strengthened the position of the WIT Port as a trans-shipment port at the mid-stream of the Yangtze River. The Group has also developed port related services including agency and integrated logistics service businesses to expand its revenue sources, including bonded warehousing, customs clearance, break bulk and distribution at the WIT Port. The Multi-Purpose Port, which is located adjacent to the WIT Port, extends the container handling capacity of the Group to beyond that of the WIT Port and supplements the terminal service business operation of the Group alongside the WIT Port. Given the close proximity between the WIT Port and the Multi-Purpose Port, they are jointly operated and managed by Wuhan International Container Company Limited (“WIT”). The Hannan Port, acquired by the Group in the 2nd quarter of 2016, is located along the Yangtze River in Wuhan, adjacent to the Shanghai-Chengdu, Beijing Zhuhai Expressway and within 80 kilometers of the Beijing-Guangzhou Beijing-Kowloon rail link. Wuhan, the provincial capital of Hubei, is an important transport hub in the PRC. In terms of riverway traffic, Wuhan is linked through the Yangtze River with six provinces (namely Jiangsu, Anhui, Hubei, Sichuan, Jiangxi and Hunan) and Shanghai. Given the important role of Wuhan in the development of the Yangtze River Economic Belt, the Directors consider that it is in the interests of the Group to make further investments in its port businesses in the Wuhan area. In recent years, the Group has been facing competition from its neighbouring port operator capturing marketing shares from the Group through the deployment of tariff cutting tactics to induce customers to use its port. 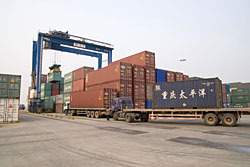 To capture the future economic growth in Wuhan and to better position itself against the competition from neighbouring ports, the acquisition of the Hannan Port Group provided an opportunity for the Group to expand its geographical coverage beyond the Yangluo Port Area where the WIT Port and the Multi-Purpose Port in Wuhan are located. The Hannan Port Group creates synergies between the WIT Port and the Hannan Port, particularly because the management team of the WIT Port has extensive experience in the construction, development and management of ports in the PRC. Being the feeder port of the WIT Port, the Hannan Port can increase the throughput capacity of the WIT Port to satisfy the demand for logistics services in Wuhan. The WIT Port, together with the Hannan Port, can provide more cost effective solutions to the Group’s customers. As the Hannan Port is planned to be developed into a multi-purpose service platform in phases, providing terminal, warehousing and logistics services and other services including RORO (Roll on Roll off), bulk cargo transportation and storage, automobile spare parts processing and logistics services, the acquisition of the Hannan Port Group has also provided the opportunity for the Group to extend its scope of services. Phase I of the Hannan Port has been completed. Phase II, which is planned to develop as a multi-purpose port, has commenced pre-construction work in the second half of 2017. The Shayang Port is one of the major port construction projects under the “12th Five-Year Plan” of Hubei Province of the PRC, which will serve as a water transportation hub connecting surrounding six provinces, is an essential material distribution centre of Central Wuhan and also a superior port area for the middle reaches of the Han River. The investment was made as part of the Group’s strategy to establish a synergistic connection between the Shayang Port and the WIT Port in the Yangtze River Basin. This serves to maximise the WIT Port’s advantage as a logistics centre of the Yangtze River, which is in line with the development trend of “The Belt and Road” policy in the PRC, and is beneficial to the Group implementing its strategic aims in the Yangtze River Basin. The Shayang Port has six berths. One-year trial operation of the port has been completed in 2017 and the port is expected to commence commercial operation in 2018. Equipment for the fourth berth is under testing and the berth is expected to commence operations in the first half of 2018. The stacking yard and other facilities adjacent to the port is under construction and is expected to be completed in the first half of 2018. The Shipai Port is located in Shipai County, Zhongxiang City of the PRC and is intended to be developed into a port, logistics and industrial mixed-use port district with an area of approximately 25 square kilometers. The port portion of the Shipai Port will occupy an area of approximately 2.5 square kilometers with four (4) 1000-tonne class berths, and a logistics park covering approximately 2.5 square kilometers to be constructed next to the port area. The investment in the Shipai Port provides an opportunity for the Group to expand its geographical coverage and create synergy among its ports. One-year trial operation of the port has been completed in 2017 and the port will commence commercial operations in 2018. Construction of the central stacking yard is expected to commence in the first half of 2018. Zhongji Tongshang Municipal Construction Engineering (Wuhan) Co., Ltd.* ( 中基通商市政工程（武漢）有限公司 (formerly known as Hubei Haiwote Municipal Construction Engineering Co. Limited*, 湖北海沃特市政工程有限公司), (“Zhongji Tongshang Construction”) acquired by the Group in January 2017, is principally engaged in undertaking municipal construction projects. The acquisition of Zhongji Tongshang Construction will act as the platform for the Group to diversify its business and explore new business opportunities in the construction industries. Although Zhongji Tongshang Construction had not obtained any municipal construction projects before it was acquired by the Group, it has been negotiating for taking up the role of main contractor in municipal construction projects with a focus on ancillary infrastructure in Hubei Province. As a main contractor in a municipal construction project, Zhongji Tongshang Construction will be expected to act as the entity in charge of the entire project, and will be responsible for completion or outsourcing of the construction works and supervision of the project to ensure that it will be completed on time and within budget, and ensuring that the construction work will meet all relevant regulations and quality standards. In light of the rapid urbanisation of and urban development in the PRC, the municipal engineering and infrastructure construction market is expected to be further enlarged which will benefit the Group as a whole. 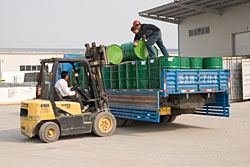 Leveraging the Group’s extensive experience in the operation and management of various ports and terminals located within the Yangtze River Basin in Hubei Province, coupled with its solid customer and supplier network cultivated during its many years of business operation, Tongshang Supply Chain Management (Wuhan) Co., Ltd.*（通商供應鏈管理（武漢）有限公 司） (“Tongshang Supply Chain”) serves as the principal supply chain service provider and trader for up-stream suppliers and down-stream customers through the supply chain management and trading business of the Group. The development of supply chain management and trading business will enable the Group to establish deeper connections with both supply and demand sides of the supply chain, engage in various businesses such as trading, logistics, storage and delivery, and enhance efficiency of integrated services. At the same time, it will enable the Group to consolidate and optimise flows of commodities, capital and information for the supply chain, which will facilitate trading enterprises to enhance intelligent trading, reduce costs and strengthen competitiveness. Currently, upstream suppliers of the Group include PRC quartz sand processing plants, whereas downstream customers of the Group include PRC glass manufacturers. The Group targets to establish deeper and more stable connections with both supply and demand sides of the supply chain and further enlarge the product varieties and customer base in the future. For the year ended 31 December 2017, the Group’s revenue amounted to HK$234.45 million (2016: HK$207.03 million), representing an increase of 13.2% as compared to 2016. The increase was mainly due to the offsetting effect of (i) the increase in revenue of HK$8.58 million in port and warehouse leasing income of the property business of the Hannan Port; (ii) the revenue of HK$18.77 million from the supply chain management and trading business which commenced operation in early 2017; (iii) the increase of HK$4.16 million in terminal service business and the decrease of HK$6.15 million in container handling, storage & other service as the increase in containers handled was offset by the drop in overall tariff rates as a result of a higher mix of trans-shipment cargo containers with relatively lower tariff rates and the lowering of overall tariff rates to align with those charged by neighbouring competing ports during the year to increase competitiveness; and (iv) the increase in revenue of HK$1.06 million in the integrated logistics service business. Total throughput achieved by WIT for 2017 was 510,078 TEUs, which was an increase of 104,694 TEUs or 25.8% of that of 405,384 TEUs for 2016. Of the 510,078 TEUs handled in 2017, 289,341 TEUs (2016: 270,228 TEUs) or 56.7% (2016: 66.7%) and 220,737 TEUs (2016: 135,156 TEUs) or 43.3% (2016: 33.3%) were attributed to gateway cargoes and trans-shipment cargoes, respectively. The gateway cargoes throughput increased by 7.1% to 289,341 TEUs (2016: 270,228 TEUs) and the trans-shipment cargoes throughput increased by 63.3% to 220,737 TEUs (2016: 135,156 TEUs). The increase in overall container throughput for the year ended 31 December 2017 was attributable to the 7.1% and 63.3% increase of gateway cargoes and trans-shipment cargoes respectively. While continuing to align tariff rates with those charged by neighbouring competing ports to increase competitiveness, since early 2017, the Group has also taken initiative to increase business at the WIT Port from existing customers through the enhancement of quality of services and drive to develop new import (inbound) businesses. As a result, gateway cargoes for domestic import increased by 29.2% to 99,292 TEUs (2016: 76,829 TEUs). Throughput of two major trans-shipment routes, namely the Luzhou/Chongqing and Yichang/ Jingzhou routes increased by 18.2% to 61,321 TEUs (2016: 51,889 TEUs) and 176.6% to 40,962 TEUs (2016: 14,811 TEUs) respectively as compared to 2016. In terms of market share, for the year ended 31 December 2017, WIT’s market share increased to approximately 42.8% (2016: 37.4%) based on a total of 1,191,475 TEUs (2016: 1,084,540 TEUs) handled for the whole of Wuhan in 2017. The increase in market share was mainly attributable to the increase in throughput volume during the year. Tariffs which were denominated in Renminbi (“RMB”), were converted into Hong Kong Dollars, which is the reporting currency of the Group. The average tariff for gateway cargoes for the year under review was RMB223 (equivalent to approximately HK$257) per TEU (2016: RMB224 (equivalent to approximately HK$262) per TEU), remained at the similar level as compared to that of 2016. The average tariff for trans-shipment cargoes was RMB49 (equivalent to approximately HK$56) per TEU (2016: RMB45 (equivalent to approximately HK$53) per TEU), an increase of 8.9% on that of 2016. The integrated logistics service business of the Group provides agency and logistics services, including provision of freight forwarding, customs clearance, transportation of containers and logistics management. Revenue generated from the integrated logistics service business increased marginally by HK$1.06 million to HK$76.45 million (2016: HK$75.39 million), which accounted for approximately 32.6% of the Group’s total revenue for the year ended 31 December 2017 (2016: 36.4%). General and bulk cargoes increased by 20.4% to 81,463 tons (2016: 67,641 tons) in 2017. However, the contribution of general and bulk cargoes was minimal and accounted for approximately 1.0% of the Group’s revenue for the year under review. Property business Income for the property business is generated from port and warehouse leasing business of the Hannan Port. Hannan Port owns investment properties of leasehold lands, berth, commercial buildings, and pontoon located in Wuhan, the PRC. A major leasing agreement was signed in the second quarter of 2016 to lease a G.F.A of 51,564.88 square metres in warehouse and workshop area from 1 July 2016 for one year, which accounted for 86.9% of total G.F.A available for lease in Zall EcoIndustry City（卓爾生態工業城）, Phase 1 of the Hannan Port. The leasing agreement, which expired on 30 June 2017, was renewed for another year. Income for the property business is generated from port and warehouse leasing business of the Hannan Port. Hannan Port owns investment properties of leasehold lands, berth, commercial buildings, and pontoon located in Wuhan, the PRC. A major leasing agreement was signed in the second quarter of 2016 to lease a G.F.A of 51,564.88 square metres in warehouse and workshop area from 1 July 2016 for one year, which accounted for 86.9% of total G.F.A available for lease in Zall EcoIndustry City（卓爾生態工業城）, Phase 1 of the Hannan Port. The leasing agreement, which expired on 30 June 2017, was renewed for another year. Gross profit increased by 9.4% to HK$108.78 million (2016: HK$99.41 million). Gross profit margin was 46.4%, slightly decreased by 1.6 percentage point as compared to 2016 (2016: 48.0%). These were mainly due to the offsetting effect of (i) the increase in container throughput which was offset by the drop in overall container tariff rates as a result of a higher mix of trans-shipment cargo containers with relatively lower tariff rates and the lowering of tariff rates to align with those charged by neighbouring competing ports during the year to increase competitiveness; (ii) lower gross profit margin generated from supply chain management and trading business which accounted for 8.0% of total revenue; and (iii) relatively higher gross profit margin generated from the property business of the Hannan Port, which accounted for 14.3% of total revenue. Other income for 2017 rose by 107.2% to HK$61.75 million (2016: HK$29.80 million). The increase was mainly attributable to the increase in government subsidies recognised by the Group from HK$28.10 million in 2016 to HK$60.81 million for the year ended 31 December 2017. The increase mainly comprised of government subsidies of HK$23.0 million and HK$18.29 million granted to support the development of the Shipai Port and logistics centre adjacent to the Shayang Port respectively.